Just to follow up on my earlier post on the Honda 'Earth Car'. Here are the figures. Oooouuch. I reckon this one is going to backfire on Honda. The new Honda F1 car has been getting a lot of press lately. 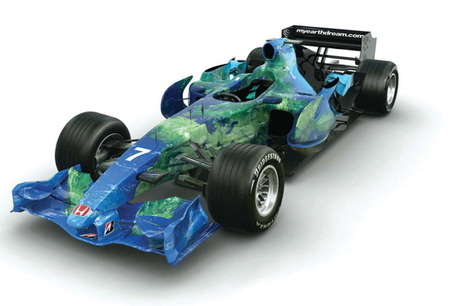 Honda say the flashy new paint job is designed to "raise awareness of environmental issues and to encourage people everywhere to make a difference to the world around them". Hmmm. I'm not sure. It's a difficult balance to get right and raises an interesting debate every time. The optimist in me says it's good that someone is raising the issue but the cynic says if they really wanted to do something for the environment wouldn't they get out of motor sport?